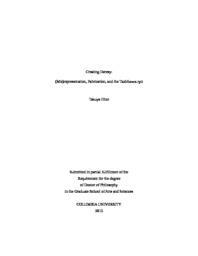 In this dissertation I provide a detailed analysis of the role played by the Tachikawa-ryu in the development of Japanese esoteric Buddhist doctrine during the medieval period (900-1200). In doing so, I seek to challenge currently held, inaccurate views of the role played by this tradition in the history of Japanese esoteric Buddhism and Japanese religion more generally. The Tachikawa-ryu, which has yet to receive sustained attention in English-language scholarship, began in the twelfth century and later came to be denounced as heretical by mainstream Buddhist institutions. The project will be divided into four sections: three of these will each focus on a different chronological stage in the development of the Tachikawa-ryu, while the introduction will address the portrayal of this tradition in twentieth-century scholarship.